It is quite common for people everywhere to view their pets as members of the family but here in the south, we tend to go one step further and build our homes around our dogs. In the 18th and 19th century, it was quite common here in the south to build homes referred to as "dogtrot" house. 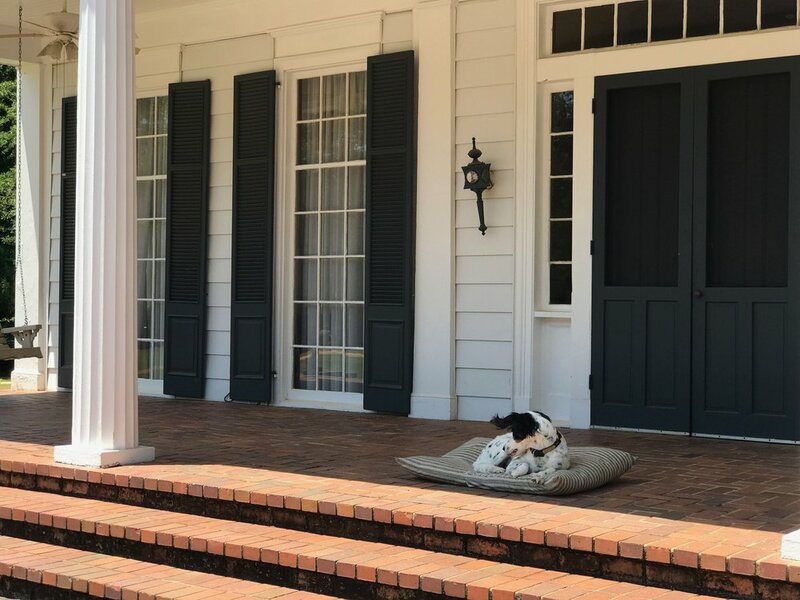 These homes were built with a large breezeway through the center of the house to keep its occupants cool by providing shade and catching the breeze but it also served as a common sleeping space for the family dogs. The small town in Alabama where I am from is full of these adorable houses. 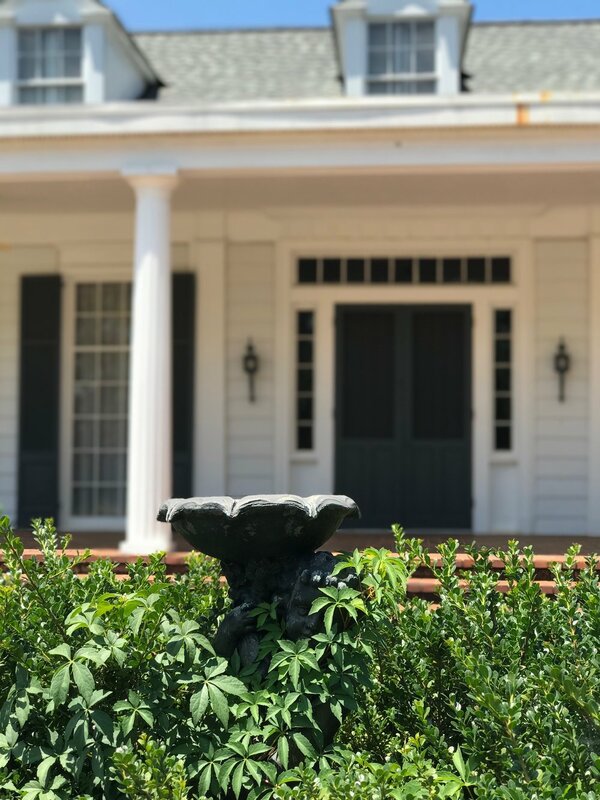 (I always found it so interesting to learn the history of these homes!) Anyway, my point was we are serious about our dogs being included as members of the family and I wanted to find a durable yet stylish bed for Patton! 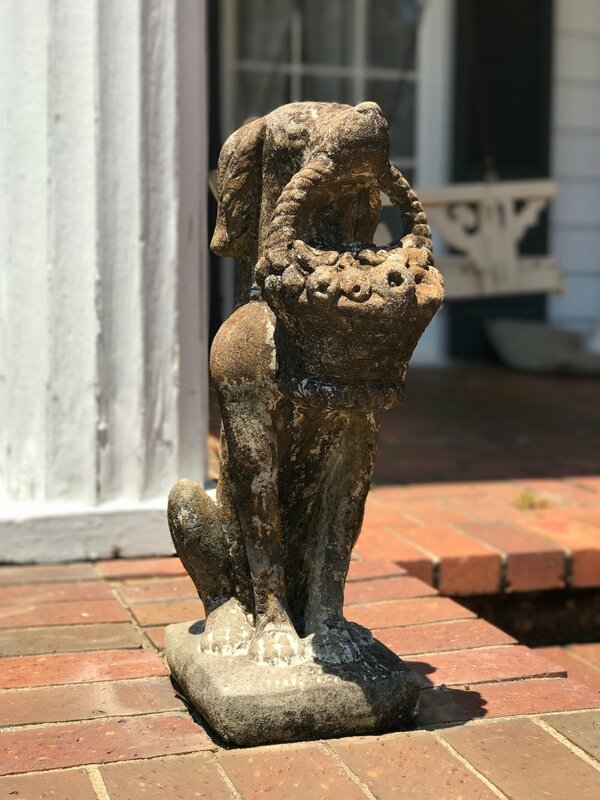 One that could be placed on the front porch for him to soak in the sun and one that wouldn't look terribly out of place in the house! (You know those dog beds that just stick out like a sore thumb and ruin whatever aesthetic you were going for with your living room or bedroom decor?....Yeah, I've had those and it was high time for a change!) That's where my friend Rose at The Foggy Dog came in! I came across Rose's shop on Etsy and fell IN LOVE with her handcrafted (made right here in the good ole' USA) dog beds! Rose's eye for detail and quality makes these dog beds stand out from the crowd. She has some of the prettiest fabrics to choose from to ensure that it blends with whatever decor you have in your house! (Because who isn't tired of stashing the dog bed in the hallway closet when guests come over?!) Thanks to Rose's delightful designs you no longer have to! Patton has LOVED his bed. It's got great cushion to it and the fabric holds up in the washing machine when it's time to launder his linens! Be sure to check out Rose's Etsy shop - The Foggy Dog to order beds for your fur child! She also has tons of other cute items for your pets! Special thanks to The Foggy Dog for sponsoring this post! Happy Tuesday loves! I hope everyone is having a great start to their summer! I just wanted to share this gorgeous blush pink kimono from ROMWE with you all! This piece has been a staple for me throughout the spring and summer. It's just the dreamiest color and I always receive tons of compliments when I wear it out! It is currently on sale for $14.99!! Which is crazy but such a steal so basically you should go grab you one ASAP before they sell out! I have worn this kimono/wrap with jeans, dresses, shorts, etc! (Basically I wear it all the time!!) It is just so easy to throw on and helps to complete my look! I feel that it is such a great piece in that it can easily be dressed up or down and can be worn in a variety of ways! Trust me when I say that you need this kimono/wrap in your life!! So be sure to visit ROMWE's website to get yours before they're gone!! I hope you all have a great rest of the week!! Thanks to ROMWE for sponsoring this post!! Today I'm sharing with you a few of these gorgeous woven basket handbags that are all the rage right now! Mine in the previous post is vintage so I couldn't link the exact one. The bags above vary in price and are SO cute if you have been looking for one for the summer! Mine was purchased from Etsy last year so you could also check to see if you may be able to find something there or ebay! Hope you all are having a happy Thursday!! Hi loves! I hope you all had a fabulous Memorial Day weekend! Mine was spent moving into my new house in Birmingham! For those who have not heard, I have started graduate school at Samford University to get my masters in Speech-Language Pathology! I am very excited about this next chapter of life and can't wait to share all of my new experiences in this new city with you all! So stay tuned! Anyway, I just wanted to share this outfit post from a few weekends ago with you all to let you guys know that this adorable blue ruffle top from ROMWE is on sale for $13.99!! I LOVE ROMWE!! They have the cutest pieces the best prices! This top is SUPER cute and at this price it honestly won't last long at all so hurry and grab yours while it's still in stock!! I have also gotten multiple compliments on my sunglasses and handbag so I have linked some similar ones in the details section above for you all to shop! * Thanks to ROMWE for sponsoring this post!